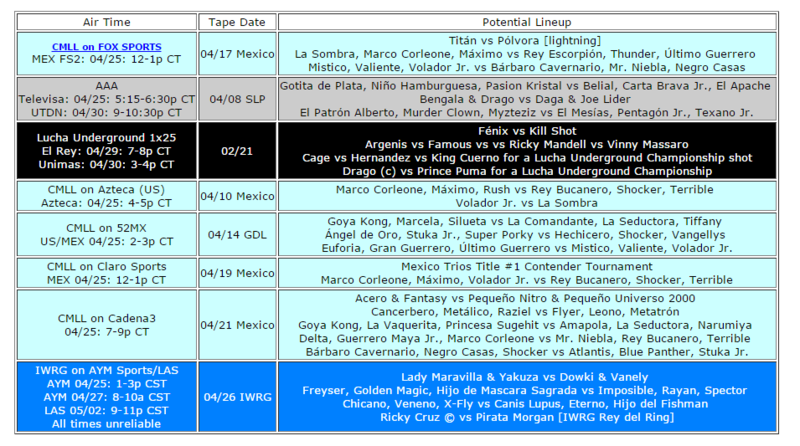 FULL, Leyendas Inmortales and Noches de Coliseo also should be on, but I have even less an idea of them. AULL is starting this week, and should air part of their champions tournament. Yesterday’s numbers included all matches for everyone regardless of what promotion they were working for. Today, we’ll look at results strictly for each promotion. The full chart is here. around 111 wrestlers appeared on AAA TV tapings. Texano Jr. didn’t take all 19 loses, but he was on a lost of losing sides for a guy who was champion. He was a rudo, and the top 7 most loses all rudos. He was only on TV a lot; he and Texano had the most matches. Faby Apache, Fenix, and Pentagon were tied with third, and it’s mostly the younger crew at the top. Includes some of the FILL shows. 211 wrestlers appeared at least once though there may be some duplicate names, and not all FILL rookies are included. Metaleon was IWRG’s rookie of the year, with lots of matches and big wins. Hip Hop Man lost nearly 10 more than the closest runner up because he wrestled so much. He worked a lot in other places too and was generally busy. 28 wrestlers had more matches in IWRG than anyone had on AAA TV tapings. There really aren’t many AAA TV tapings. Only including Mexico City appearances. 145 wrestlers worked a main CMLL show. I really whiffed on noticing Valiente’s obvious candidacy for wrestler of the year. Felino is on too much and in too big of matches, but at least he’s not winning them. (La Mascara, even less over on the internet, is tied for second.) The Violencia think is still weird. Dark Angel would be next at 74%; maybe never getting a feud means she’s not cheated out of wins by rudas much. Sure, why not. Note that many DTU shows do not have known results. The lack of results make those numbers not so useful. There’s other people who had more than 10 announced matches and a better win percentage than Drastick (like Flamita and the Nerds), but a bunch of their matches had no known results. Does not include Lucha Memes. More than 129 different luchadors appeared on a Chilanga Mask show. Appearances are not evenly disturbed – there’s a DF core group, special guests, and local wrestlers all depending on where they’re running the show that day – so the leaders are mostly those guys who happen to be around a lot. I’ve also included Cara Lucha on the sheet, but it’s too few appearances to mean much. Soberano Jr. replaced Star Jr. on Saturday. Stigma beat SIgno. Porky sat on Mephisto for the win. 5) Euforia, Gran Guerrero, Último Guerrero b Mistico, Valiente, Volador Jr.
Main event sets up a title match. Tercera does not, at least so far. Violento Jack kept the DTU title over X-Fly in Arena Aficion, with X-Fly suffering an right ankle injury during the match. It’s possible Violento Jack will set the DTU title reign length record before his next defense. Oriental took Zumbido’s hair in Arena Azteca Budokan. Zumbido has lost a lot of weight. Verdugo passed away yesterday. He was one of four brothers who went into lucha libre with Hombre Bala, Pirara Morgan, and La Marquesa. He and Pirata formed a pirate themed trio. Verdugo switched to Troglodita in the 90s, part of a caveman themed trios, and briefly used the names Fenomeno and Black Bull, but was mostly known as Verdugo as he spent his post-CMLL career around Mexico City. He was 57. Old friend Kenzo Suzuki was a virtual lock for this tournament. The rest of his team are actually not in AJPW right now, but work various small promotions. Takayama actually worked in CMLL back in 2007, when Ultimo Dragon brought him and Minoru Suzuki in for a DragonMania and they goofed their way thru a Sunday Coliseo match. He should be better here, and this team seem like it has a better chance of going far. Ishimori was part of Toryumon Mexico and appeared in AAA over the years. His last appearance was in 2010, winning the tag titles with Morishimia. They’d lose them in Japan to a different NOAH team. Kotoge (like Masamune) was an Osaka Pro regular. He’s moved over to NOAH in recent years. There was a press conference for the 05/16 ex-AAA show, featuring former members of the promotion. Shows with ex-AAA luchadors are not a rare thing, but they’re promoting this around the 23rd anniversary of the promotion they’re not longer in but some helped start. Octagon took the advantage to do more interviews complaining about AAA stealing his name, as he’s been doing for half a year now. Nothing new in them. Octagon continues to maintain he’s got a clear legal case, but there doesn’t seem to be much movement on this. It seems more like Octagon is trying to win his case thru pressure via the media. In other Octagon news, he’ll face Atlantis on a Chilanga Mask show on June 21st. No venue is listed, just “Estado de Mexico”. Chilanga Mask has been working on getting Octagon & Atlantis in the same ring since last year. They were costars in a movie in the early 90s, right before Octagon left to join AAA. CMLL Informa announced there’d be a press conference next week, so perhaps things will actually happen. The only angle on the show was Rey Escorpion pretending to be Ultimo Guerrero’s friend again. Ultimo Guerrero totally went with it, even though it was clear Rey Escorpion was being dishonest. They’re opponents on Friday, so this didn’t actually make any sense. CMLL Informa also announced music group Angeles Azules will perform before Sunday’s Arena Mexico show. CMLL had a famous group play before this year’s Anniversary, and I recall them being annoyed that so few people were actually listening to them. It’s a crowd getting there just before the start and not generally interested in music performances, but maybe CMLL feels like it makes for a bigger show. The debut episode of Somebody’s Gotta Do It on CNN tonight at 9ET is a lucha libre episode, with features on local mask maker Manuel Quiroz and LuchaVaVoom. There’s a preview on their site. +LuchaTV has words from La Park (doesn’t work for free), Rush (talking up his hair and down Wagner), Damian getting hurt against Ciclope and Pagano vs Nicho. Titan would like to defend his title again, and would be happy to put it up against Barbaro Cavernario. Virus declared he was going for the welterweight titles on CMLL Informa. There’s a video interview with El Fantasma here, but I haven’t had a chance to listen to it see if he says anything interesting.